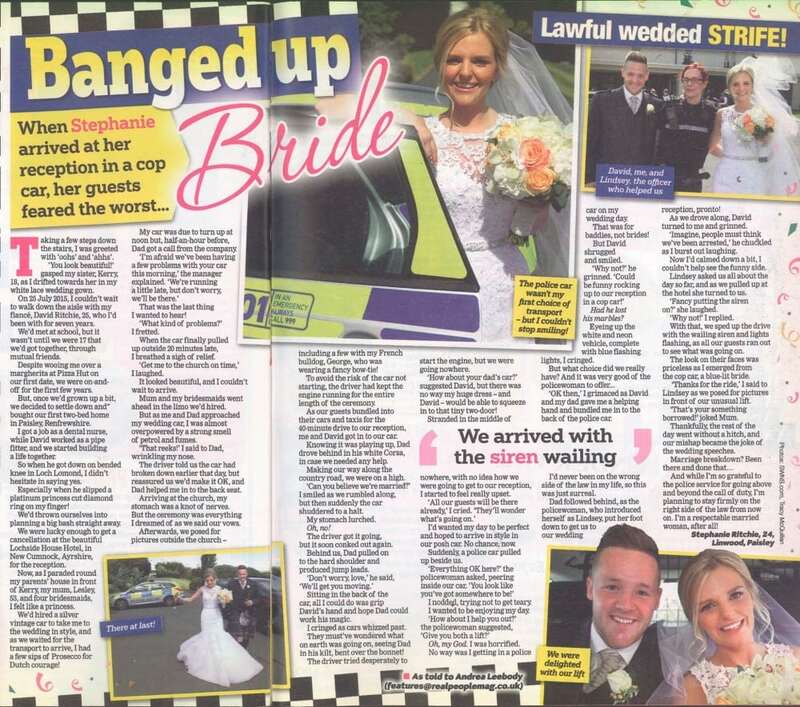 Sell a funny story to a magazine like this banged up bride! We helped Bride Stephanie sell a funny story to a magazine about being taken to her wedding reception in the back of a police car! Stepping into my beautiful fish tail wedding dress, I was careful not to ruin my hair or my make up on the most magical day of my life. As I stood up to have a look in the mirror, I twirled around to face to my five bridesmaids, and my face erupted into a huge smile. “Feel free to cry at any point,” I said, laughing to my braids maids. You look absolutely amazing,” my younger sister Kerry, 18, cried. My stomach tightened in nervous knots as I looked out my bedroom window and saw the beautiful traditional silver wedding car, waiting to take me to the church in Paisley. As I attempted to gracefully plod down the stairs in my dress and heels, my dad shed a tear from the corner of his eye. “Aw my little baby, you look stunning,” he said. My eyes started to water as well. “You look lovely too,” I replied giving him a huge hug. He grabbed my hand and led me to the car. “Oh it’s lovely in here isn’t dad,” I said, attempting not to suffocate him with my dress. 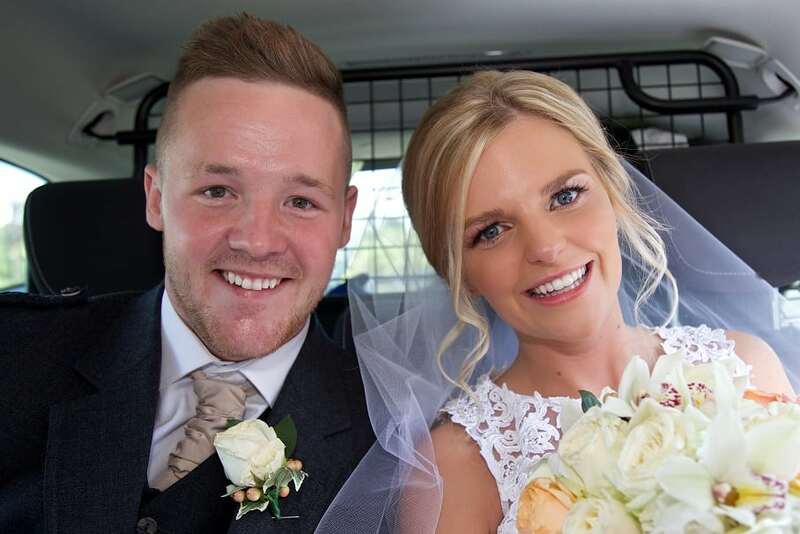 As we set off, we waved goodbye to my beautiful bridesmaids and my mum, Jackie 45, and I couldn’t wait to meet David at the altar and for everyone else to join me. “Get me to the church on time….” I started singing as we drove along the road, laughing to my dad. The church was only four miles away from my house, so it didn’t take long to travel there. What seemed like a life time later, I stepped out of the car. I wanted to run inside to marry the love of my life. 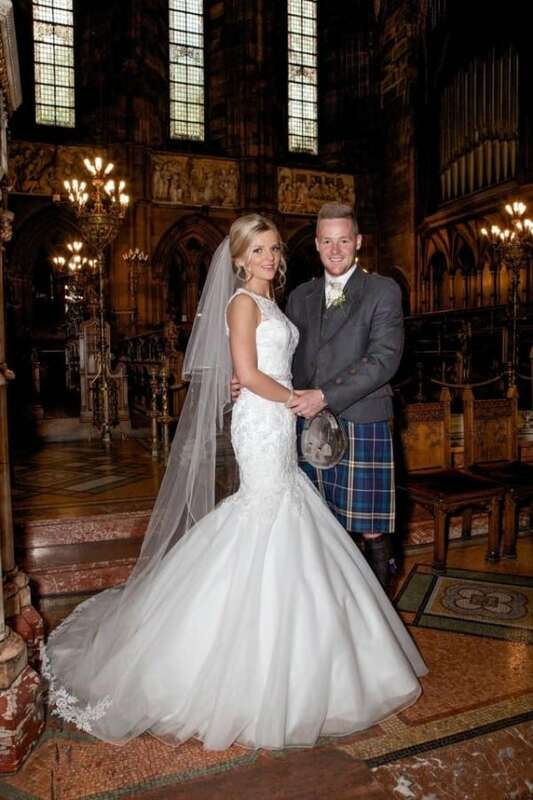 As the wedding song played as I walked down the aisle, I saw David standing at the other end. My smile was ear to ear as he placed a kiss on my cheek. “I love you,” he whispered in my ear. “I love you too,” I beamed. The ceremony was beautiful. We said our ‘I dos’ and as we walked towards the silver vintage car, David’s face lit up as he saw it for the first time. Shaking all of the confetti from our hair, we held hands on en route to Lockside House Hotel 40 miles away from the church. “Can you believe we’re married, David!” I screamed hugging him. “I know. You’re my wife. It sounds so weird,” he replied. With a thud, the car suddenly stopped dead as we approached a set of temporary traffic lights. “Oh god that didn’t sound good did it? Imagine we get stuck at the lights and we didn’t make it to the reception on time,” I joked. But with a clunk, the car came to a stop. The engine failed to start after four or five attempts. We were stranded. A jump start didn’t help and I stayed sat in the back, miserable, while David got out in his suite to investigate. As David and the driver managed to push the car into the side of road, a police car pulled in behind us, about 20 minutes later, to see if we needed a little help. Time was ticking by and everyone would be wondering where we were. “You okay here?” The officer asked. “Yes, we’re fine, just a bit of car trouble,” I replied solemnly. 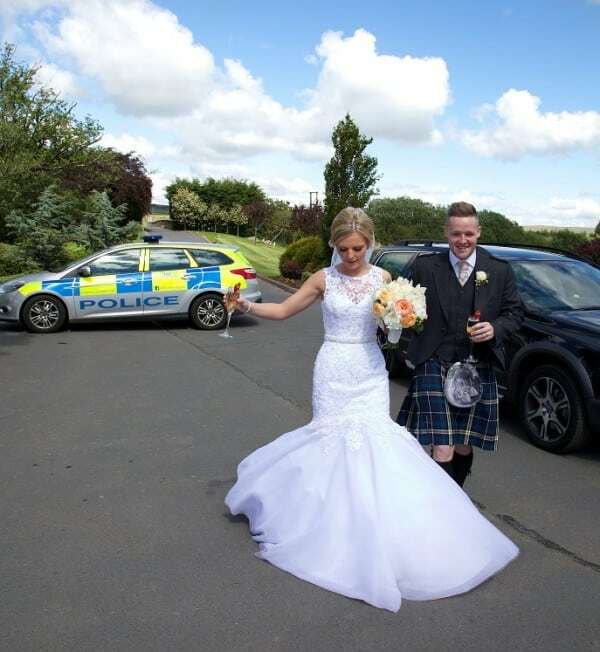 “Need a lift?” PC Lynsey Arthur of Cumnock Police Office, Ayrshire said. David just looked at me, he knew my face, and he knew that there were two chances of me getting that police car, no chance and a dog’s chance. “Come on Steph, it would be really funny, imagine everyone’s faces as we pull up in a police car, plus, what other option do we have?” David said with a huge smile on his face. I could tell he wanted to ride in the car, so I reluctantly accepted. “That would be lovely, thank you so much.” I said looking inside the car, weary. “You may have saved the day.” Lynsey helped me pile my dress into the back seat of the car and David took the front seat as it was too small for the both of us. As I looked around, I could see grey, black and metal. It smelt a little funny, but was really clean. 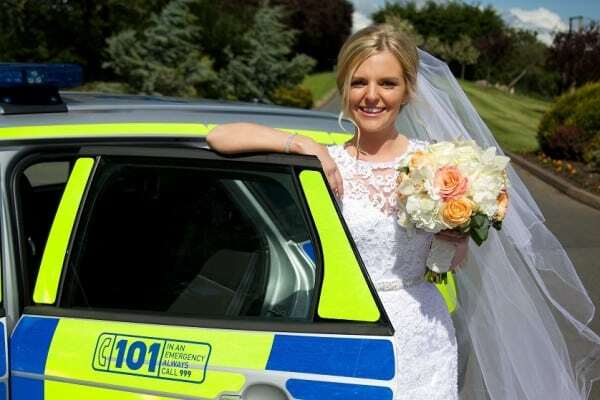 “I can’t believe I’m in a police car on my wedding day,” I said smiling. “Oh it’s so funny!” David replied. I then started to enjoy the ride to our reception. As long as I was with David nothing mattered. As we pulled into the long drive, we asked Lynsey to put on the blue lights, she did and everyone came running out to greet us, cheering. Their smiles were priceless and it was such an amazing experience. It wasn’t quite the transport we had hoped to arrive in, but I managed to keep my spirits high and I couldn’t stop smiling when we arrived at the venue. 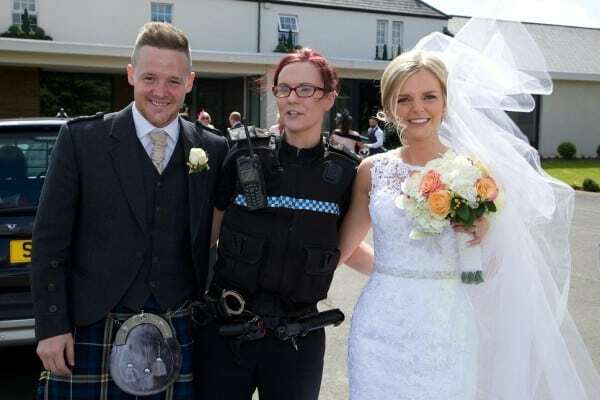 Lynsey totally saved the day and went far beyond her line of duty. She was a star! We were lucky with so much else on the day, especially with the weather, and we’ve now got something to tell the kids and grandkids about for years to come. Would you like to sell a funny story to a magazine? At SellUsYourStory.com, the UK’s largest independent press agency, we want to hear your stories whether they are important awareness raising issues, or lighthearted true tales guaranteed to raise a smile. We helped Stephanie sell her story exclusively to Real People magazine. If you have any story that you believe would make a good magazine feature, complete our STORY VALUATION form on this page and we’ll let you know how much your story is worth. There is no obligation and we’ll only use what you send us for valuation purposes until you tell us otherwise (you only need to provide the basic outline of what happened for now). We guarantee to get you the most money for your story, so what are you waiting for?